The enTourage eDGe dualbook has been officially ushered in at CES, along with the news it'll be on sale in February for $490. It's the world's first dualbook, which translates as an ereader, tablet, notepad and PMP. The dual-screen enTourage eDGe sounds more than decent, for anyone considering either an ereader, tablet PC or PMP. I like convergence when it actually works, and this Android job sounds like it works. 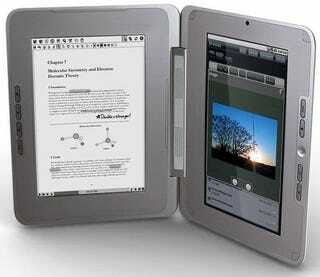 The device has a 9.7-inch e-paper screen on the left, and a 10.1-inch LCD screen on the right. Wi-Fi is included for web browsing, or downloading ebooks, and a noise-cancelling microphone and 1.3-megapixel camera allows for video and audio recording, with audio files saved as MP3s. Ebooks are downloaded in PDF and EPUB format, with enTourage creating its own ebook store, with everything coming from Google. It may not be up and running by the time it goes on sale in February, but obviously you can download ebooks through other means. With all those functions, battery life is six hours when using the LCD screen, or seven days when using just the ereader. It's possible to use both screens at once, either held flat like a book, or with one screen folded back to show just one side.